We love using natural products in our home, especially due to allergies and asthma. Our cleaning and laundry products are all chosen carefully. We have been able to help Mr. T and Mr. F with a lot of their challenges through diet. I believe in natural living as a means to better health. We do utilize medication when it’s needed, but try to avoid it whenever possible. One way we do this is through essential oils. WAIT!!! Before you click away, I am not an MLM distributor (you know, like the YL and DT companies.) I don’t use MLM oils, and while I will tell you what brands we use, there are other non-MLM brands out there that have excellent reputations for quality oils. I want to share because I get asked often what oils we use and how we use them. If you want to know more about the actual chemistry of how they work, let me know. I love sharing the extra sciency stuff! 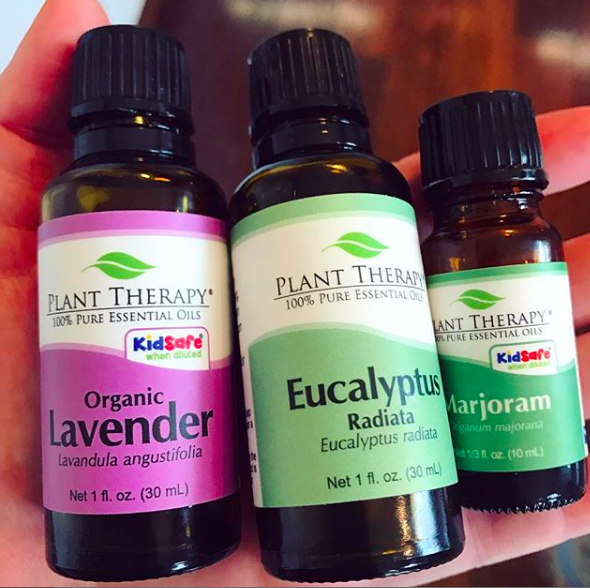 Being a homeschool mom means I can share the benefits of essential oils with my kids throughout the day. In the schoolroom, in bedrooms, in the living room, and even in the car. Essential oils should never be used in a public school classroom due to respiratory challenges some children face. While oils are natural, that doesn’t mean people can’t have a reaction. 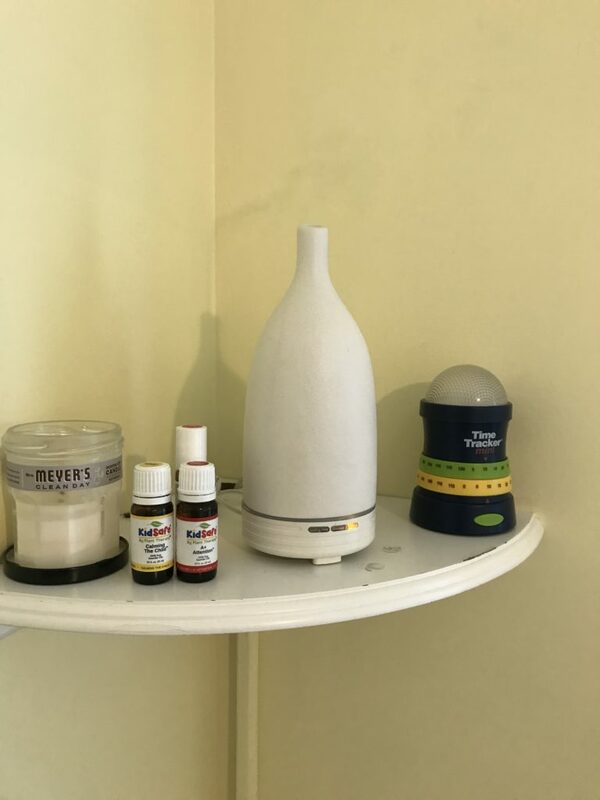 Our most favorite diffuser and a few of our school room oil blends. 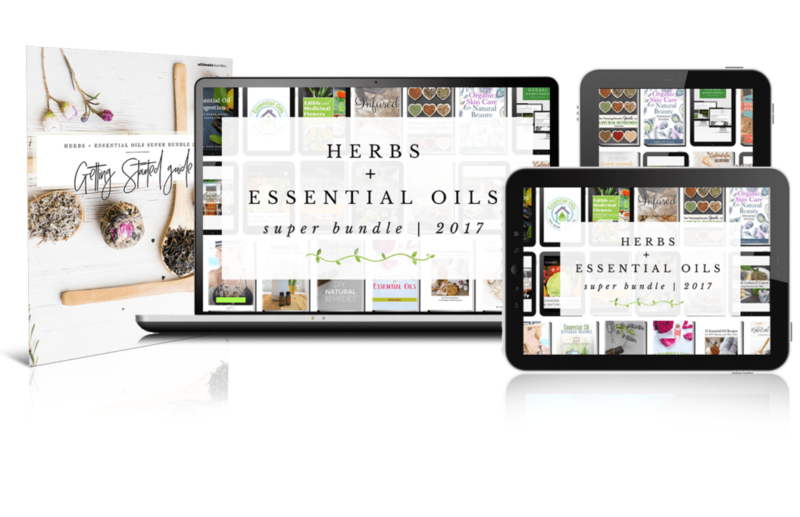 I have been using essential oils for longer than they have been the “cool” thing to do (I won’t give you a number on years), and using them with my children is a wonderful experience. They even ask for them when they need them, which is pretty awesome. I’m able to provide diffused oils to help seasonal allergies, improve focus and concentration, treat boo-boos, and fight attention deficits in a natural way. Since essential oils are derived from plants and plant parts, I can feel good about what I’m using in our household. They are a regular part of our daily lives. Before we get into specific oils there are a few things you should know about using essential oils around children. While we are more of the French mindset with oils, these are disclaimers you should heed, especially if you are not well versed in essential oils and their uses. Never use synthetic oils; only 100% pure quality oils. “Therapeutic grade” is a term that doesn’t hold any weight. It was created by MLM companies and is not regulated. We use and recommend Plant Therapy because of their strict standards and I know exactly what I’m getting (there is also free shipping). They have a KidSafe line that I adore! We also use Veriditas by Pranarom for some oils and blends, these are EcoCert certified organic. Use appropriate dilution for children; Essential oils should always be diluted and even more so for children because of their high potency. Use caution! Only diffuse for short periods of time. Do not run your diffuser constantly, children are highly sensitive and can’t handle the potency of the oils. I suggest trying out single oils first and see how your child responds before introducing other oils. Be careful using essential oils around children with asthma or allergies. Some oils may exacerbate these conditions. In these situations, I recommend working with an educated aromatherapist to explore the effects. Our aromatherapist and our naturopathic doctor have helped us over the years to find the ones that work best for the boys. 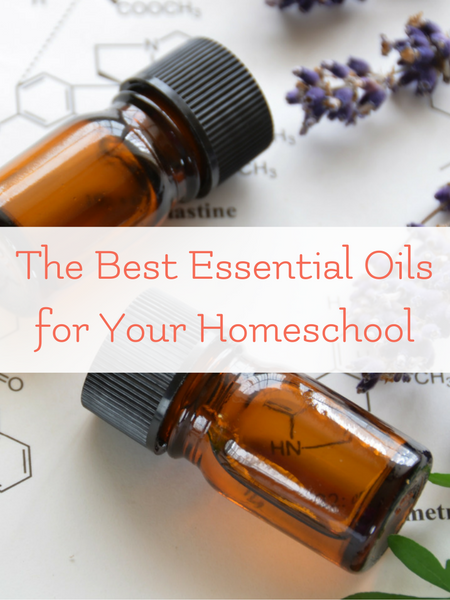 Now that we’ve covered the basics I’ll share some of my favorite essential oils that every homeschooler needs. Citrus oils calm overstimulated children while also boosting mood. Orange and Grapefruit essential oils are perfect for regulating emotions and I love them because they smell wonderful! They work great for helping out mom when faced with a lot of life’s stressors. For a blend that’s already mixed, try Calming the Child. Vetiver essential oil is my go-to oil for focusing the mind. Vetiver offers huge benefits for the learning process and can aid your child into quieting the mind and improving concentration so they can absorb information and focus on the task at hand. Vetiver blends beautifully with lavender and we really enjoy the A+ Attention blend. Rosemary essential oil is known to boost brain performance which is beneficial to both student and teacher. You might find that your child is able to connect the dots a little easier and it could help with comprehension and understanding when dealing with difficult subject matter. If the kids aren’t moving in the morning or if you’re feeling sluggish yourself, try a blend of peppermint and orange oils to combat fatigue and boost energy. Peppermint essential oil can increase stamina and be just what you need to get the ball rolling in the morning. It’s also great for headaches and nausea when stomach bugs go round. Plant Therapy’s Immune Bloom is a wonderful synergy blend designed just for kids and is a great choice for purifying the air and protecting your household when sickness is going around. There’s even a diluted roll-on that makes application to their feet super easy! Germ Fighter and Germ Destroyer are also great. The Veriditas version is Good Samaritan and it is lovely. We have allergy induced asthma and reactive airways here and our favorite oils for that are eucalyptus radiata, lavender, and sweet marjoram. For allergy relief, during allergy season we use lemon, peppermint, and lavender. For nights when my sweet boys can’t get their brain to shut off, we love the Nighty Night blend (I diluted the big bottle into a roller with sweet almond oil). It works in synergy with the Warmies the boys have, they are wonderfully soft and slightly weighted stuffed animals filled with flax seed and lavender. You heat them in the microwave to warm them and the combination of those with the oils helps my busy-brained boys drift away to sleep. 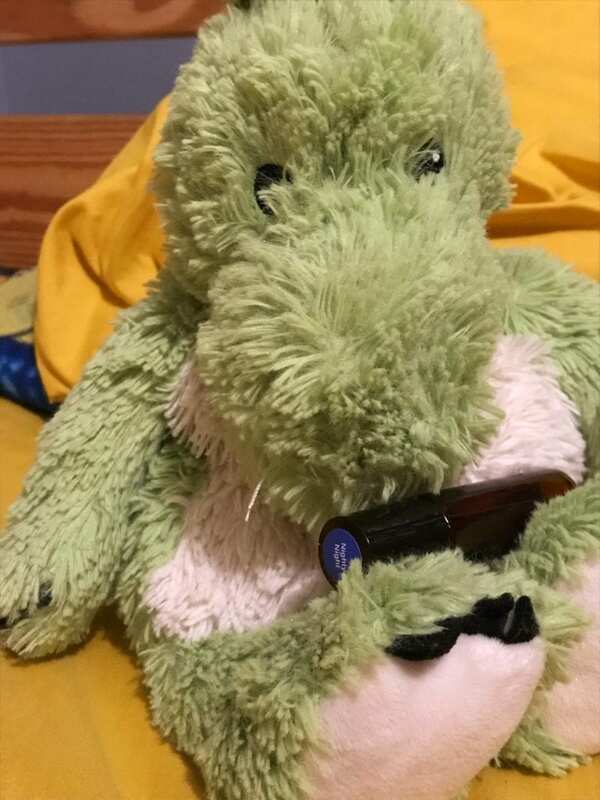 For bug bite reactions, we have some severe reactions to those and we get them on nature walks from time to time, we use Frankincense Carteri, lavender, and top it off with colloidal silver gel applied 3-4 times the first day, and 2-3 times a day till it clears. This isn’t a comprehensive list, but it is the ones we use most for our homeschool. What oil are you most curious about? Let us know which ones you try!